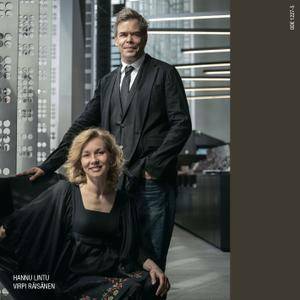 Ondine continues its exciting releases focusing on 20th century masterpieces together with conductor Hannu Lintu and the Finnish Radio Symphony Orchestra. 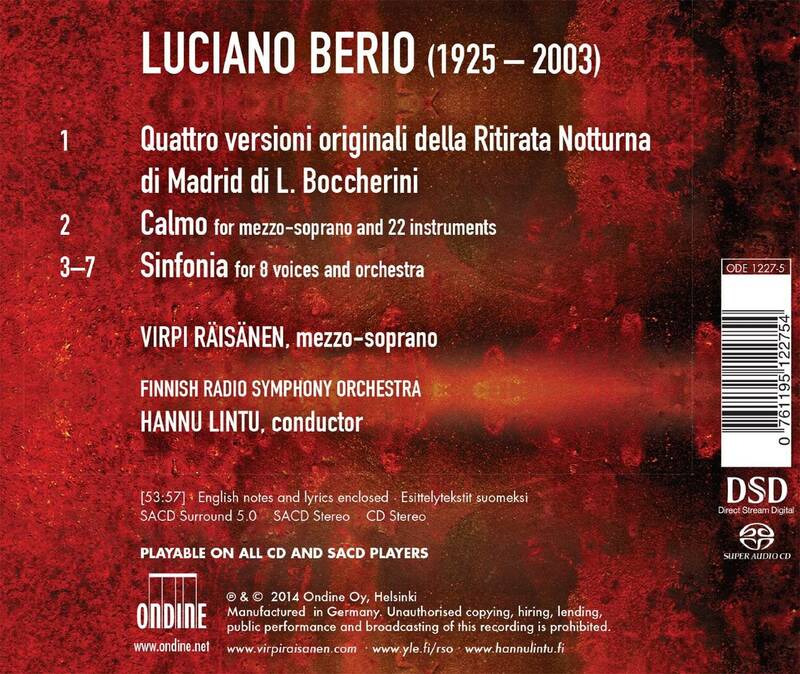 This release is dedicated to the orchestral works by the pioneer of Italian modernism Luciano Berio. Berio’s 5-movement Sinfonia, is undoubtedly his most well-known work, written for the New York Philharmonic and dedicated to Leonard Bernstein. It has become one of the key works and principle musical manifestations of the 1960s bringing together collage technique and modernism. Without doubt the major work of Luciano Berio's career, Sinfonia was a touchstone of the avant-garde of the mid-20th century, because it represented virtually all of the cutting-edge techniques in its collage of texts and musical quotations and created a sensation unlike any contemporaneous work. Originally composed for the Swingle Singers, the pop vocal octet led by Ward Swingle, and premiered by Berio and the New York Philharmonic, Sinfonia conveyed the confusion and unrest that dominated the news and the arts in 1968, yet transcended its time to be just as urgent and meaningful today. 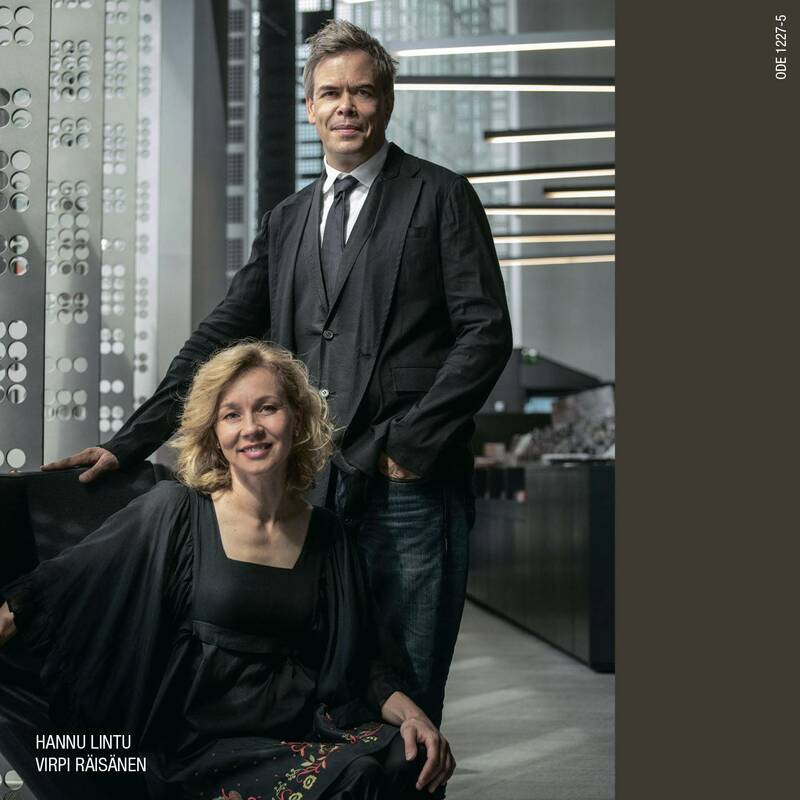 This 2014 Ondine multichannel SACD of Hannu Lintu's performance with the Finnish Radio Symphony Orchestra boasts superior sound that makes other recordings seem flat in comparison, and the eight amplified singers who take on the Swingle Singers' virtuosic parts are evenly matched in skill and range. Important sections to sample are the second movement, "O King" (track 4) and "In ruhig fließender Bewegung," the massive collage on Mahler's Scherzo from the "Resurrection" Symphony (track 5), in which Berio combines texts of Claude Lévi-Strauss and Samuel Beckett with overlapping references to other seminal classical works. This album also includes two later compositions from the 1970s, Calmo, for mezzo-soprano and 22 instruments, and the four versions on Boccherini's Rittrata notturna di Madrid. 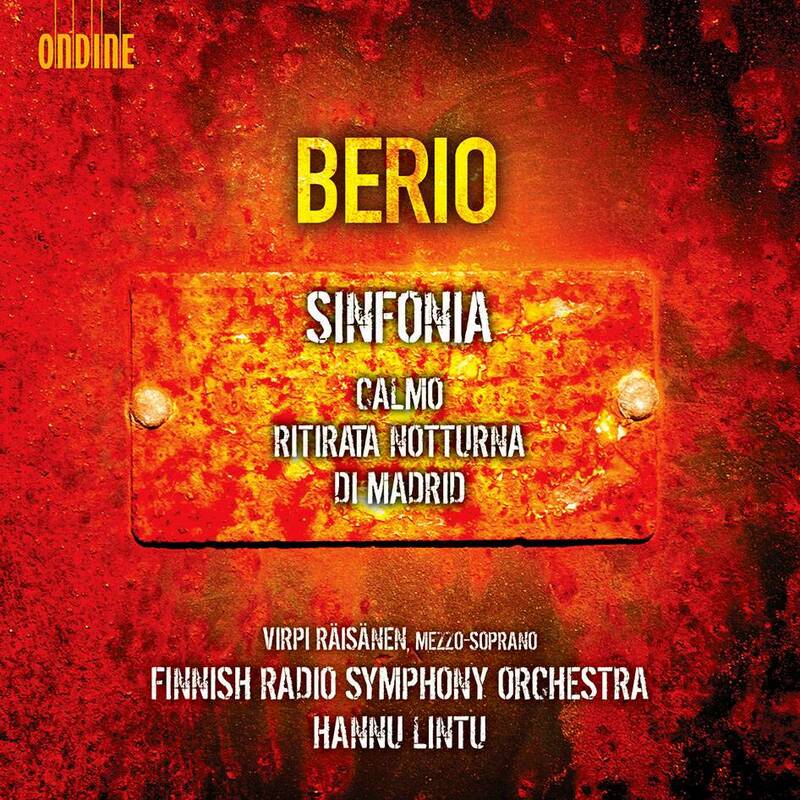 While these short pieces reflect Berio's abiding interests in experimental music for voice and re-orchestrations of Classical music, they have little emotional impact when placed next to the monumental Sinfonia, which overwhelms with its intensity and chimeric originality. From the last hurrah of Boccherini’s four simultaneous nocturnal parties disappearing round the street corner yet hanging in the night air of Madrid, emerges a rattle of bells and a singer, like a priestess with her thyrsus, who with a compilation of ancient and surrealist texts conducts a spirit across the threshold from life to death. 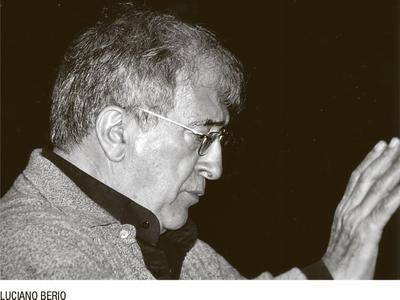 Calmo (1974, expanded in 1989) is a tribute to Bruno Maderna, who had died the previous year, as devout and sincere to his memory and yet characteristic of its creator as the funeral tread of Boulez’s Rituel. 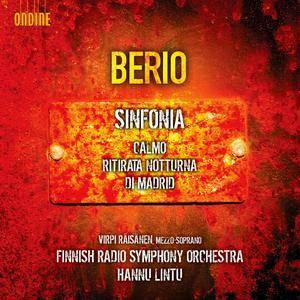 Any singer must exorcise the ghost of Cathy Berberian in this and other vocal works of Berio and, as the actor of heroines from Haydn to Nono, Virpi Räisänen has the measure of it. She uses more pure tone but has no shortage of the rich chest register required for the oracular pronouncement of lines from Psalm 57 and Homer’s Odyssey. Sinfonia is among a select group of works from the 1960s in danger of becoming a ‘classic’ – I’m thinking also of the War Requiem and Eight Songs for a Mad King. Maybe it isn’t a danger at all – their publishers must be pleased, and the opportunity to see them in concert is always welcome – but there’s a paradox that, through the very singularity of their form and forces as much as their music, they have come to represent a time and a kind of emotional and political energy now hallowed but softened by memory, at risk even of becoming kitsch or cute. The DG recording of Sinfonia conducted by Peter Eötvös is an example of this classicising tendency, always respectful of music that rebels against the very idea of demanding or giving respect. Heritage, in the shape of Mahler and Debussy and Strauss and the rest, is a set of musical tools to be picked up and set down at will. In Hannu Lintu’s marvellous new recording I hear and admire a rediscovery of the impatience and invention that drove Berio to write it, in the forward, piano-led instrumental balance and the unapologetic grandeur of the finale’s climax. 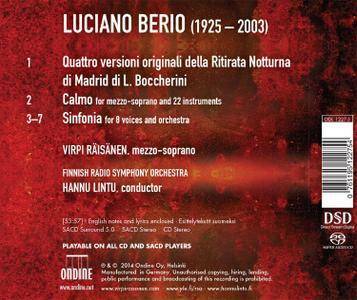 The eight solo voices don’t draw the attention as much as on other recordings but the import of their texts, both Lévi-Strauss and street slogans, is carried by the orchestral commentary, not least the excellent brass section of the Finnish Radio Symphony Orchestra. Lintu’s pacing is slightly more generous than Riccardo Chailly’s on Decca and he uses this space to impassioned rhetorical effect, especially in the angry, still spaces of the second movement’s elegy to Martin Luther King. DR16 -0.18 dB -22.48 dB 6:09 03-Sinfonia for 8 voices and orchestra - I.
DR15 -9.97 dB -30.84 dB 3:15 06-Sinfonia for 8 voices and orchestra - IV. DR14 -0.23 dB -19.78 dB 6:47 07-Sinfonia for 8 voices and orchestra - V.